TradeStation is a US broker with a long history dating back to 1982. Its parent company, the Monex Group is listed on the Tokyo stock exchange. TradeStation is considered safe as it is regulated by a top-tier regulator, the US FINRA. Clients are eligible for the SIPC investor protection scheme which offers up to $500,000 (cash up to $250,000) per account. TradeStation mobile platform is great. It is user-friendly and well-designed. You can use a wide range of research tools, e.g. detailed fundamental data. Lastly, the education section is high-quality and well-structured. The deposit and withdrawal are not user-friendly and you can use only bank transfer. There is no forex. The customer service can be improved as the response time on email and live chat is very slow. TradeStation has low trading fees and there are multiple fee structures to choose from. Non-trading fees, like inactivity fees are high. Inactivity fee High $50 USD per year if less than 2000 USD on balance or less than 5 trades per year. We compare Tradestation fees with its peers, Interactive Brokers, tastyworks, Saxo Bank and DEGIRO. TradeStation trading fees are low. You can choose from more fee structures. For example, if you trade stock rarely and in a high volume you want a the fixed $5 per trade deal. If you trade frequently with a few stocks you want to pay a vairable fee, which is $0.01 per share with a minimum of $1. You can change the fee structure whenever you want. Per trade: all trade costs a fixed $5 per trade. It is recommended if you don't trade frequently, but in a higher volume. Per share: the commission is $0.01 per share, but there is a minimum $1. It is recommended if you trade frequently but in a smaller volume. Unbundled pricing: trades are priced like the 'per share', but if you trade more than 100,000 shares per month, fees decrease gradually. It is recommended for very high volume traders. We calculated with the per share comission, because for our benchmark this was more favorable, and the brokers we compare TradeStation to also charge per share. TradeStation stock trading fees are low. 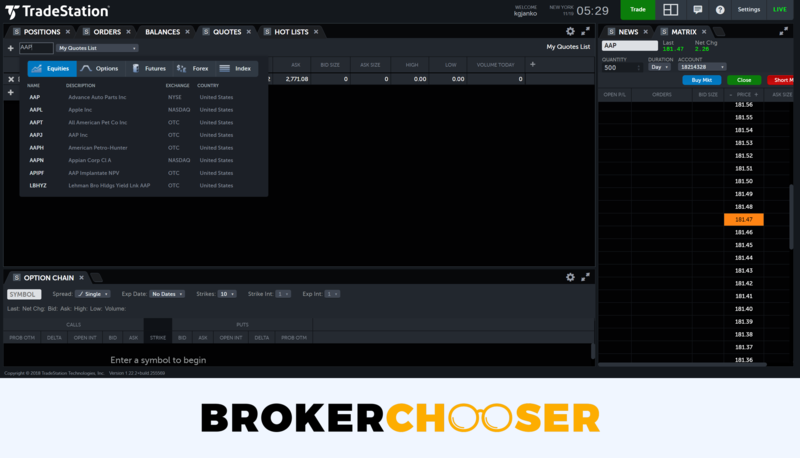 It is the same as Interactive Brokers and better than tastyworks or Saxo Bank. If you plan to trade with more than ~$10,000, switch to the per trade structure. TradeStation's mutual fund fees are high. It is mainly because of the high $14.95 fix commission per trade. On the US market, it has the same fee as IB, but it is higher than DEGIRO. On the European market, it has higher fees than its competitors. TradeStation bond fees are high. The bond fees include a fix $14.95 and a $5 per bond fee. Per contract + per trade: there is a fix $0.5 per contract and $5 per trade commissions. It is recommended if you don't trade frequently, but in a higher volume. Per contract: the commission is $1 per contract. It is recommended if you trade frequently but in a smaller volume. We calculated with the the per contract fee structure because for our benchmark this was more favorable, and the brokers we compare TradeStation to also charge per contract. TradeStation's options fees are low, but a slightly higher than IB and tastyworks. If you plan to trade with more than 10 contracts, the per contract + per trade fee structure is more favorable. TradeStation's futures fees are low at the European markets. However, it has higher US futures fees than Interactive Brokers or tastyworks. The futures commissions are based on the traded volume. The more you trade, the less commission you pay. If you want to trade on margin and prefer to hold your positions long, financing costs can be significants. TradeStation financing rates are high compared to its peers. TradeStation non-trading fees are high. As a plus, there is no deposit fee. However, there are high withdrawal and inactivity fees. These fees favor the high volume traders. TradeStation account opening is fully digital and user-friendly. On the other hand, it takes more days until your account is approved. 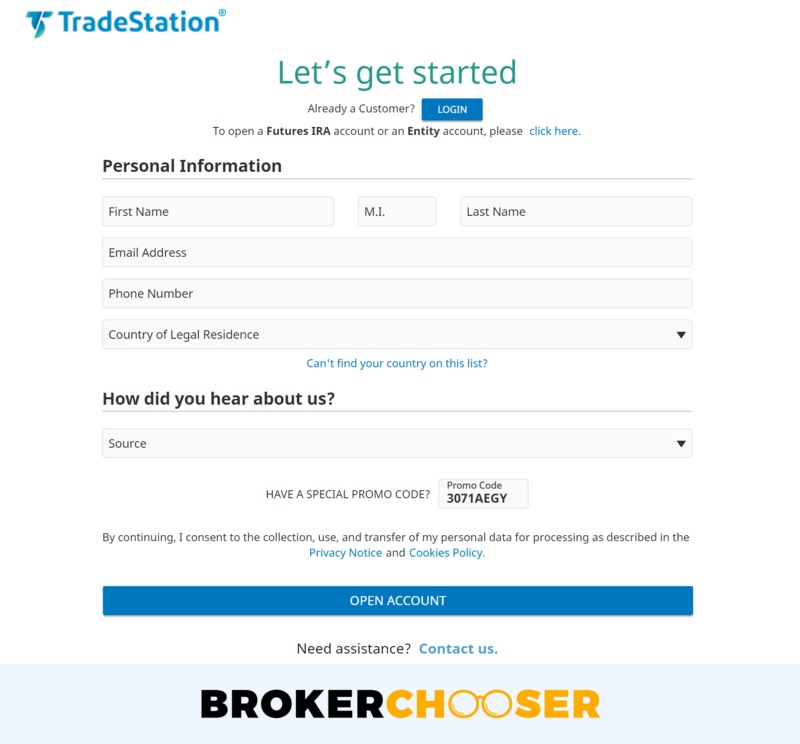 TradeStation is a US broker, but clients from all over the world can open an account. There isn't a list who can open an account. But, if you are not a citizen of a usually banned country, e.g. North Korea or Sudan, you will likely be able to open an account with TradeStation. The minimum deposit differs at the different account types. You can choose from a lot of account types. There are three questions you need to consider when you select an account type. What products do you want to trade with? Who will be the ownership of the accounts? Do you want to trade with leverage? Equities account gives you access to stocks, ETFs, bonds, funds, and options. Futures account gives you access to futures. You may find further information on TradeStation's account type's page. 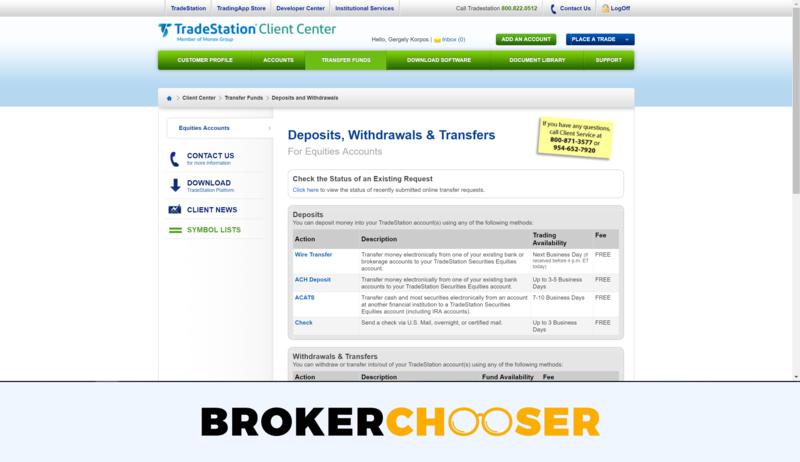 TradeStation account opening is fully digital and user-friendly. For regulatory reasons, US brokers cannot open your account instantly. 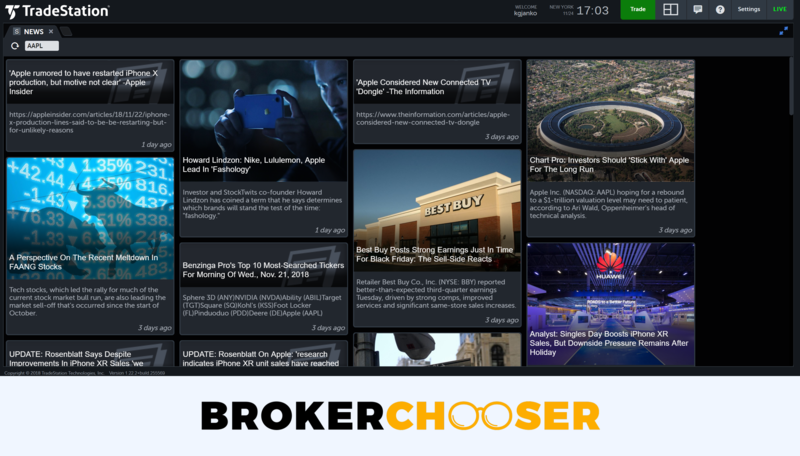 TradeStation's account opening is one of the fastest among US brokers. It usually takes 1-2 business days from registration to the account approval. 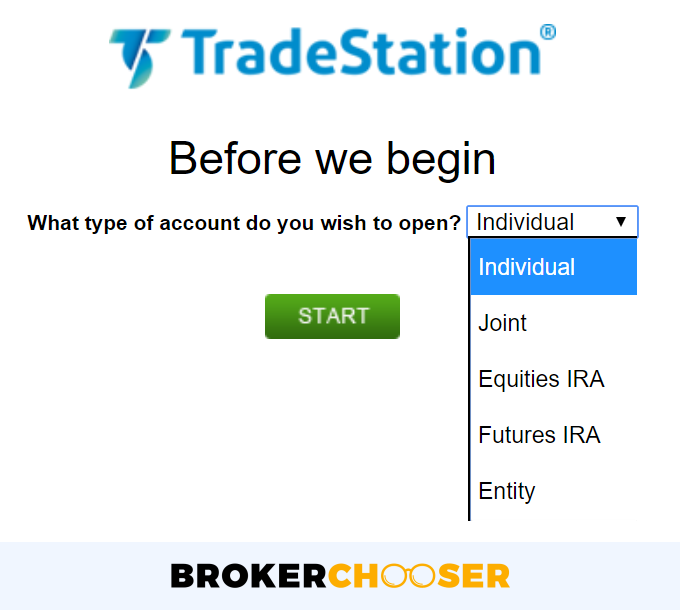 To open an account at TradeStation, you have to go through the following steps. Account setup: you choose the account type. You can also choose your personal manager. Personal information: you give your personal information, like your address or birth of date. Employment information: you give the details about your employment status and employee. Financials and experience: you answer a short questionnaire about your trading experience. You also give an estimation of your annual income and net worth. Verification: you verify your identity and proof address. For ID identification, driver’s license / passport / national ID are accepted. For proof of, address you can upload a utility bill / bank statement. TradeStation deposit and withdrawal can be improved. As a plus, the deposit is free. However, you can use only bank transfer and there is a high, $35 withdrawal fee. If you open an equity account, only USD is available. For futures accounts you can choose from a great selection of base currencies: USD, EUR, GBP, AUD, CAD, HKD, SGD, CHF, and JPY. TradeStation deposit is free of charge. On the other hand, you can use only bank transfer. This is a bit of a letdown, but quite common at other US brokers too. The bank transfer time for US clients usually takes one day, while for non-US clients it can be even 15 business days. We tested it and it took 4 business days. TradeStation withdrawal costs $35 for non-US clients, while $25 for US clients. Withdrawing money can be done the same way as making deposits, e.g. only wire transfer for non-US citizens, plus ACH and check for US citizens. TradeStation does not provide information on how many days the withdrawal can take. We tested the non-US bank withdrawal and it took 3 business days. TradeStation has a good web trading platform. It is user-friendly with and looks nice. It also offers a great order management. On the flip side, it lacks the alerts and the clear fee reports. TradeStation renewed its web trading platform in 2018. This platform has a good design and user experience. Both first timers and professionals can feel comfortable with the platform. Currently, TradeStation's web platform is available only in English. TradeStation web trading platform is easy-to-use and has a clean design. It has also a great customizability. You can choose from several layouts but you can also make your own. The tabs can be easily resized and replaced. You can choose between a one-step and a two-step authentication. We recommend the last as it is an additional security. For using it, you have to download the Symantec VIP Access mobile app. TradeStation search function works well, but it is not intuitive where you can find it. We missed a conventional 'magnifying glass' search field. Instead, you can search the preferred products at the quotes tab. TradeStation has a very sophisticated order management. You will find orders from the basic to the professional level. If you are not familiar with the order types, read this overview. We could not find a way to set notifications or alerts. It would be useful if you can easily set up a push notification. You can check your account performance and the fees you paid at the Client center. They are really transparent. You can see your performance on the Account tab. It clearly shows what is your historical profit/loss balance and how much costs you paid. TradeStation mobile platform is great. It is very user-friendly and well-designed. You will also find all important functions, like the price alert or order management features. 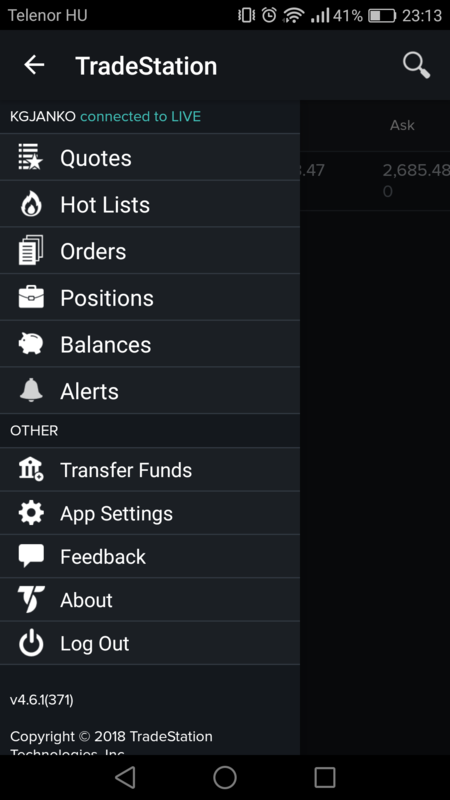 TradeStation mobile trading platform is available both on any iOS or Android devices. We tested it on Android. TradeStation mobile platform has all major functionalities than the web platform. We only detail what is different. You can log in with your TouchID. You can set price alerts which are not available on the web. TradeStation offers a desktop trading platform with advanced features and many customizable options. However, the platform is not user-friendly and best suited for advanced trader. TradeStation's desktop platform is so advanced and has so many functions that even a separate review would not be able to cover it all. Anyhow, we tried to provide a comprehensive summary. At the time of the review, the desktop platform was only available for Windows and only in English. 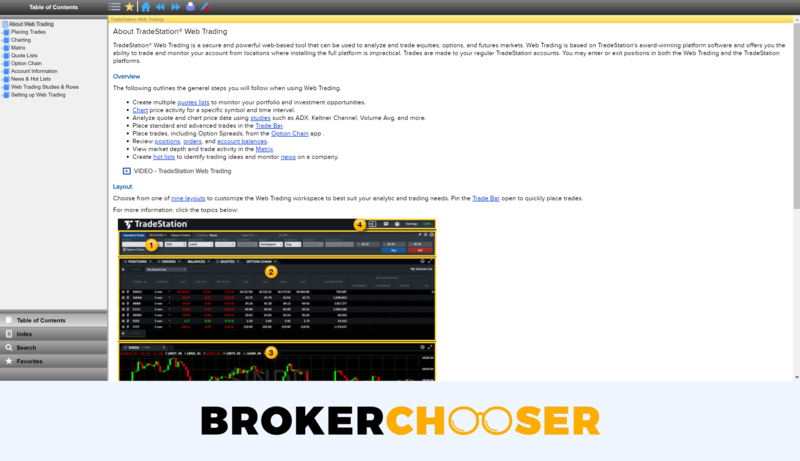 TradeStation desktop platform is not user-friendly with a very outdated look. If you are an advanced and professional user, the platform is ideal. However, if you are a first-timer or long-term investor, you can hardly take advantage of all its features. As a plus, the platform has a good customizability. Also, you can choose from pre-defined workspaces. E.g. there is a day trader or a futures trader workspace. Similarly to the web trading platform, you can set a two-step login. The search function is hard to use as each tab uses a different search feature. You can use the same order types and order terms as on the web trading platform. You can also set some advanced features, like an activation rule. However, it is not easy to find where you can place an order. If you open the Active Trader layout, there is a tab on top, called "Trade". We have read that there are price alerts you can set. However, were unable to figure out how to do that because of the platform's complexity. You can see on the "TradeManager" tab what is your profit/loss balances. But, you can't see the fees you paid. TradeStation gives you access to a wide variety of US products. However, its non-US offer is not competitive. The forex, CFDs and cryptos are missing. TradeStation has a good US stock offer. The fund, options and futures offers float between Interactive Brokers and tastyworks. At TradeStation you can trade only on the biggest US stock markets, like NYSE or NASDAQ. During our test we did not find any international market. This stock and ETF coverage is the same as tastyworks, but lags behind Interactive Brokers which covers markets all over the world. TradeStation offers funds from ~60 fund providers. It is a mid-range coverage. As a plus, you can find the largest names, such as BlackRock or Vanguard. TradeStation doesn't offer information about how many bonds you can trade with. At TadeStation you can trade with options on equities and futures. This options coverage is better than at tastyworks, but lags behind Interactive Brokers which has one of the most extensive options offer. 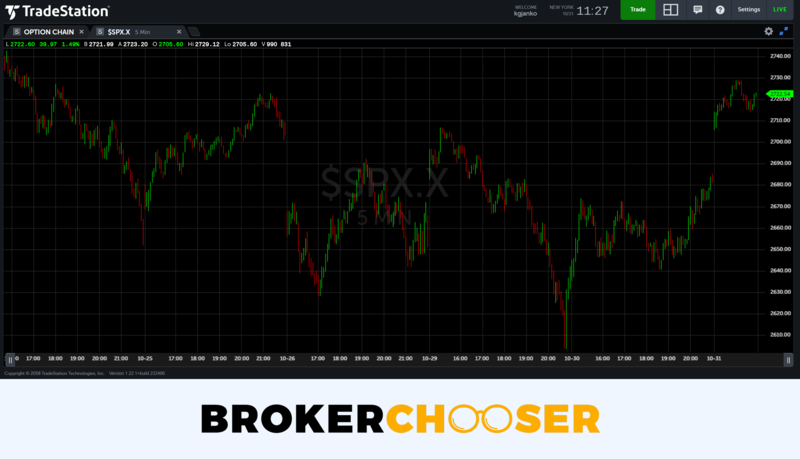 TradeStation gives you access to the biggest US futures markets, like CBOT or ICEUS. TradeStation futures offer is almost the same as tastyworks, but lags behind Interactive Brokers which covers markets all over the world. TradeStation research is great. You can use many tools, including detailed fundamental data and good quality news. On the flip side, some research tool are hard to find and not easy-to-use. This is only available on the desktop platform. You will find recommendations about each asset classes written by TradeStation staff. There is a very detailed fundamental data provided by Yahoo. However, it is only available on the desktop trading platform. You will find many data from financial statements to earning reports. The charting on the desktop platform is really advanced and covers advanced features. E.g. there are over 170 technical indicators. On the flip side, it is not user-friendly. The charting on the web trading platform is not user-friendly and lacks advanced features. TradeStation offers high-quality news. They can be found on the Market Insights and on the trading platforms. At Market insights, the news is categorized based on the products and sectors. At the trading platforms, you will see the news only if you search for a product. It is not convenient as you have to type a product's symbol and not the name. E.g. you will find news for Apple if you type AAPL. 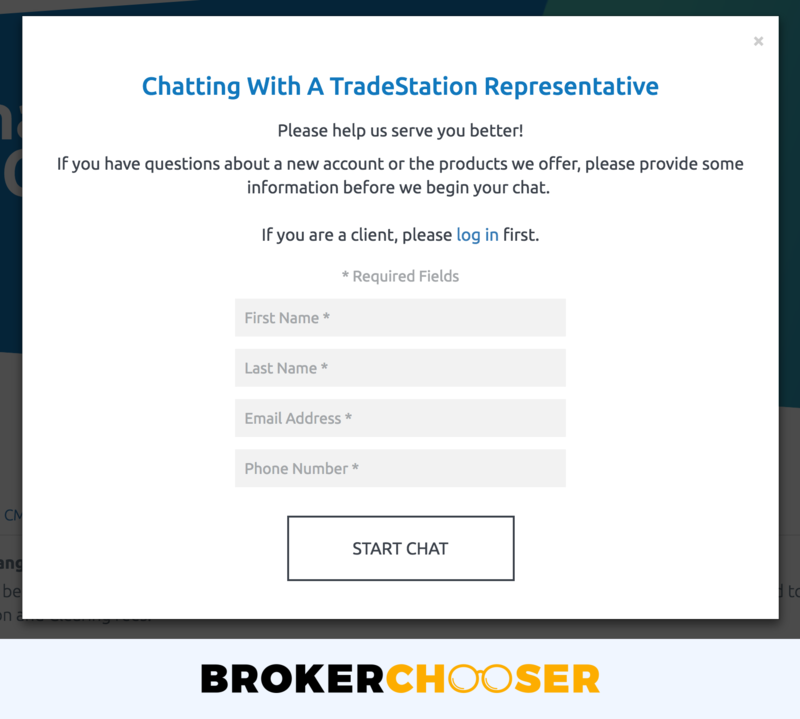 TradeStation has a great telephone support, but a slow live chat support. You can contact them only weekdays. The customer service is available only in English. TradeStation telephone support is very good. They give fast and relevant answers. The customer support persons are very kind as well. It is great that you can use live chat, but its quality is mediocre. It is available only between EST 9 am and 5 pm. We got relevant information, but the response time was slow as we had to wait an average of 10-15 minutes. TradeStation education is great. It offers many educational tools with a great quality. You can use a demo account, watch educational videos, or read articles. You can use the demo or stimulating account for getting familiar with the platform. We think this is the best way to learn how the TradeStation trading platform works. At TradeStation university, you can watch many platforms and general educational videos. It is very good that they are structured based on your knowledge and the products. When you go to Market insights and then the Education, you will find high-quality videos and articles. TradeStation is regulated by top-tier US regulator, FINRA. In addition, the parent company is listed on a stock exchange. On the flip side, negative balance protection is not provided. TradeStation is a US broker established in 1982 serving clients from all over the globe. Is TradeStation safe? To be certain, it is best to check two things: how you are protected if something goes south and what the background of the broker is. TradeStation covers all customers by one US legal entity. It is regulated by FINRA. This matters because you get the US investor protection amount, called SIPC. However, only clients with Equities accounts are eligible for this scheme. So, if you have a Futures account, you are not eligible for that. SIPC investor protection protects against the loss of cash and securities in case the broker goes bust. The limit of SIPC protection is $500,000, which includes a $250,000 limit for cash. A non-U.S. citizen with TradeStation is treated by the SIPC the same as a US resident in case something goes south. The provided amount is a substantially higher amount than most European investor protection schemes. On the flip side, TradeStation doesn't provide negative balance protection. The background of the broker matters as a strong parent company reduces the chance the company goes bust. 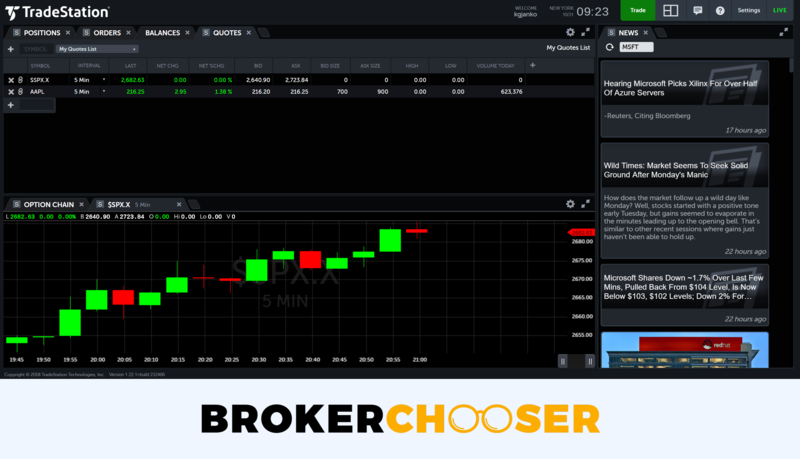 TradeStation is owned by Monex Group, a Japanese online broker. Monex Group is one of the largest online brokers in Japan and it is listed on the Japanese Stock Exchange. It is a good sign as listed companies are under more scrutiny than private companies. TradeStation's foundation dates back to 1982. During this more than 35 years, a lot of economic crisis occurred and TradeStation is still on the top among the brokers. This is also a sign for you that TradeStation is a safe broker. Being regulated by the FINRA and offering a great amount of investor protection are all great signs for TradeStation's safety. TradeStation is a great US broker. The mobile platform is very user-friendly with many functions. It also offers great research tools, including a wide range of analytical tools. Lastly, education is well-structured and high-quality. On the other hand, the deposit and withdrawal are not user-friendly and you can use only bank transfer. It lacks many asset classes, e.g. forex or CFDs. The customer service can be improved as the response time at email and chat support are very slow. Feel free to try TradeStation if you prefer Recommended for buy and hold investors with any experience level.